The Boat Racing Festival was over the men are coming home, well for this team anyway. I didn’t even know what team took the first place, or the second, or the third for that matter. 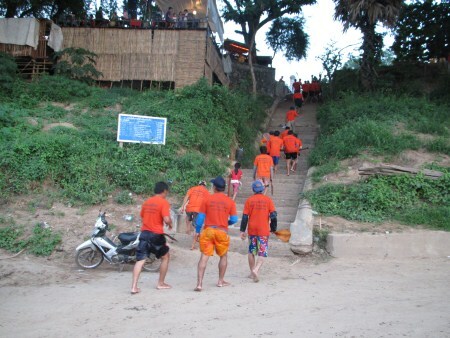 It was a small race, not like the annual boat racing festival for Luang Prabang. If I ever get a chance in the near future, I would like to visit the World Heritage Town during the boat racing festival. I’ve been to one in Pakse in 2008 and it was quite exciting and I can’t wait to cover this festival from various provinces of Laos. sabaidee DJ, ai pan ma ka leury whare tak taiy. Sabaidee Ai Amphone. Kop Chai Lai Lai for taking the time to say hi while you are passing by. Sok Dee Pee Mai!